Get to know the 44-year old actor, musician, comedian, Tim Minchin, before he got famous (e.g. His breakout show, "Dark Side"). IMDB reports The Most Annoying Pop Songs.... We Hate to Love (TV Series documentary) was Tim Minchin's first TV appearance in 2007. In 2008 he starred as Tom in his first movie Two Fists, One Heart. His home town is Northampton, England. His parents David Ellison Minchin are of Irish, English, ethnicity. 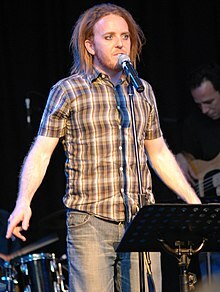 Tim Minchin was born on October 7, 1975 on a Tuesday. Tim Minchin released Canvas Bags by Tim Minchin, from the album Environmental Anthem in 2007. Share your real life experiences with Tim Minchin here and rate your meeting! Correct our wiki/bio - is he not gay or straight or of different heritage? Let us know!